Celebrating five years of sketching entertainment, Dr Sketchy’s Melbourne in collaboration with Australia’s original alternative gallery, Outre Gallery brings you it’s first Art Star tribute session featuring the dramatic art of American painter Sylvia Ji. Outre Gallery has just made the surprise announcement they will be holding a Pop-Up exhibition at the end of June featuring the powerfully mysterious and enchanting works of Sylvia Ji. With a cult following spanning the globe, this is a rare opportunity to see Sylvia’s paintings outside of America. Art Star will see Dr Sketchy’s Melbourne presenting a sketch session based on the works of Sylvia Ji. Featuring two of Melbourne’s most loved underground performers recreating Sylvia’s women in ecstasy – images where desire and death sit very close. 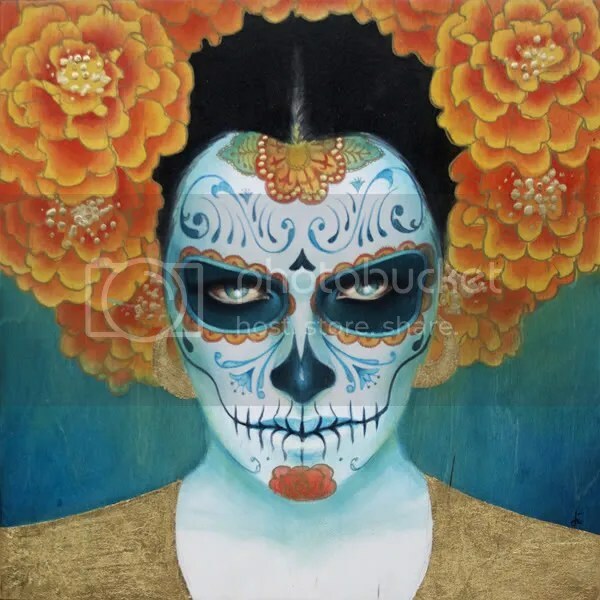 Sylvia’s works blend the mystery of Dia de los Muertos, the Otherness of femininity, the myths of beauty and a dark latent sexual energy, brought forth in rich colours and dramatic decoration. Do not miss this rare opportunity to be enchanted by the art of Sylvia Ji and bewitched by the recreation of her images at this very special exclusive Dr Sketchy session. This will be the first Dr Sketchy Art Star session outside of the US, with previous tributes to legends of the lowbrow and underground arts scene, Ron English, Tara McPherson and Cynthia Von Buhler. Sylvia Ji Tribute wrap up!